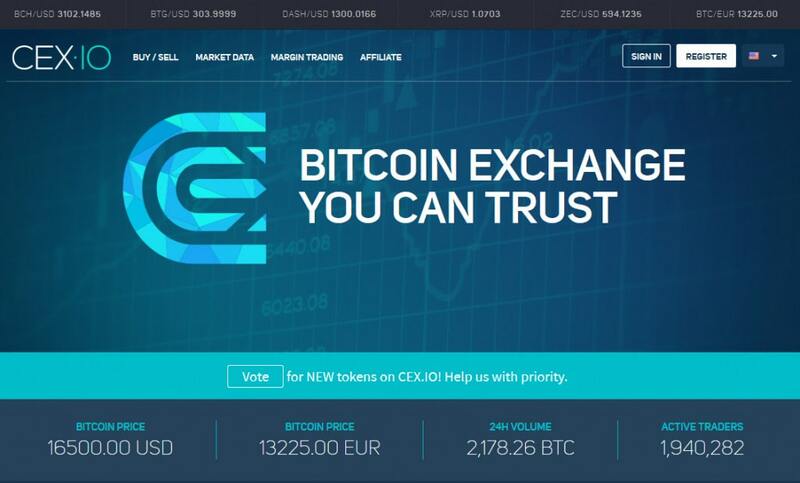 CEX.IO is a well-known exchange that started operation in 2013 with Bitcoin mining. But today, it has expanded its service line to include trading of BTC and ETH, margin trading, price widget even though it has discontinued the mining of Bitcoin. Here, I will review the exchange starting with its strengths and drawbacks. First of all, it should be mentioned that CEX.IO platform is supported by multiple channels of support. They include emails and online tickets. However, sometimes, it may take the customer care unit a longer time to respond to issues/inquiry/complaints from users. The platform is progressive and has added some altcoins currently in vogue. They allow their customers to view newer conversion rates through the affiliate buy/sell page. Moreover, 3rd party developers are able to build customized tools with the API of the platforms. Along with benefits, CEX.IO doesn’t allow to use wire transfer payments in all countries. And Bitcoin transaction fees are pretty high. Finally, not all services are available on the mobile app. Let’s check my other pros and cons. 1. Exchange rates 0.5% to 2%. 1. Only 4 currencies transfers. 2. Margin trading is available. 2. Payment methods restrictions. 3. The quickest fill-or-kill orders. 3. Card verification delays. 4. Strongly secured website. 4. Only 10 cryptocoins are traded. CEX.IO has edged the competition by providing many services to their customers. Users can purchase or sell BTC and ETH. Margin trading not offered by a number of leading exchanges is available on the platform. 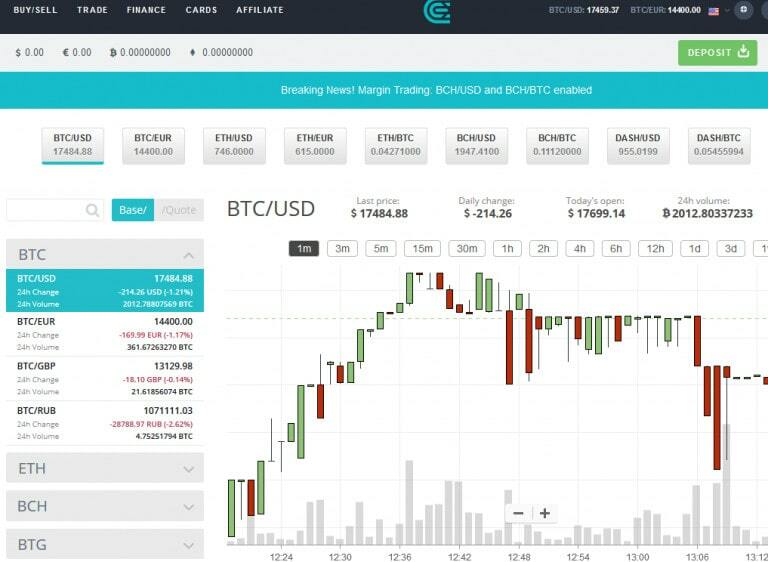 CEX.IO has some tools like API, BTC calculator, price widget, mobile app and affiliate program which make usage easier and improve user-experience. The site has a tool that users can incorporate into their websites in order to receive donations in Bitcoin. The platform provides fill-or-kill (which is normally abbreviated as FOK) in order to make buying and selling simpler and easier for the users. FOK implies that orders are fully carried out or not processed at all. With this service, clients are sure that they will receive an amount of digital currency that should not be less than a determined price that has been agreed on. In the fill-or-kill order, it is the market situation that will determine whether the order will go through or not. The exhange charges seven % for this service and the comission is paid in fiat currency. Currently CEX.io suggests buying next coins: BTC, ETH, BCH, BTG, DASH, XRP, XRM, ZEC. On its website, you’ll find info about limits of purchasing. Let’s check the most popular ones. Bitcoin transactions in CEX.IO can only be carried out in US dollars, Euros, Great Britain Pounds and Rubles. The minimum amount of bitcoin that you can purchase in this platform is 0.01BTC and the maximum you can purchase at a time is 0.3015BTC. 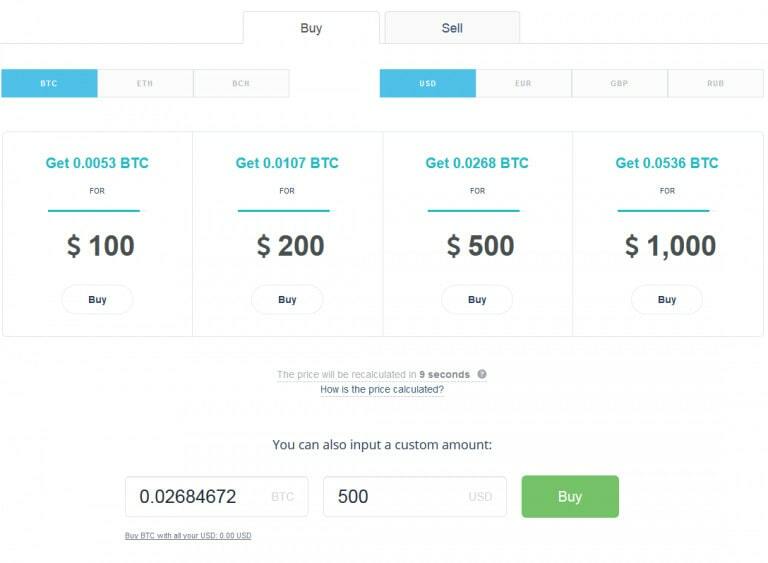 The exchange also allows users to put a custom amount. The minimum amount of Ethereum that you can purchase from this exchange is 0.05ETH. Traders are also allowed to customize the amount they want to purchase. However, buying and selling of ETH can be carried out with only USD, EUR or BTC. You register directly from the website. Signing up is achievable also via certain social media such as Facebook and Google. The icon button where you can click to sign up are already on the registration page. Confirm your email to authenticate your account. You also need to download Google authenticator so that you will obtain a six digit number serving as your access code to the site any time you want to login (it makes your account more secure as nobody will be able to access it without having access to your mobile phone). Click on Buy/Sell to start your transaction. Put money into your account so that you will be able to purchase BTC. Click on confirm order to complete the transaction. You will be redirected to the main page as soon as the transaction is completed. CEX.IO platform comes with a lot of features and offers users numerous advantages but the most important of them all is their transparent system. Traders in the site can see not just their balances but all their transactions including their archived orders, margin trading and their limits and commissions for all the pairs, cryptocurrencies and fiat money that can be traded on the platform. Furthermore, customers of the site can make limit and market orders. In the former, one can purchase or sell a predetermined volume of cryptocurrencies at a fixed amount. With the latter which is also known as the instant order, you will be able to buy or sell digital currencies instantly at the most favourable prices. The major difference between these two types of orders is that the limit orders are only carried out when another user places a trade at the matching price. Conversely, market order is matched with available offers starting from the first to last in the order book and implemented immediately. In addition to ETH/BTC pairs, CEX.IO provides other kinds of trading pairs. This varies from one market to another. Available trading pairs of US dollars in the platform are DASH/USD, BCH/USD, ZEC/USD, BTC/USD, XLM/USD, XRP/USD, BTG/USD, and ETH/USD. The pairs available in the EUR Markets are BTG/EUR, BTC/EUR, ETH/EUR, DASH/EUR, BCH/EUR, ZEC/EUR, and few more. Some cryptocurrencies that are paired with USD and EUR also form trading pairs with GBP. For RUB markets, only the BTC/RUB pair is available for trading. The exchange also offers trading pairs of BTC and a few other digital currencies which include BCH/BTC, DASH/BTC, ZEC/BTC, XLM/BTC, GHS/BTC, and some others. The available kinds of trading charts in CEX.OI are bars, candles, Hollow Candles, Heikin Ashi, Line, Baseline, Renko, Line Break, Kagi and Point & Figure. The exchange offers users a variety of trading time scales of 1m, 3m, 5m, 15m, 30 min, 1hr – 12hrs, one day, one-three weeks. There are three groups of indicators to look at when trading in CEX.IO. They include technical analysis, fundamentals, and economy & symbols. Each comprises various types. The most popular ones are Moving Average, Moving Average Exponential, Relative Strength Index, Know Sure Thing, Mass Index. Trading fees are determined by several factors. First is the trading pair or the digital currency you are trading in which, for new comers, starts at a rate of around 0.002% for all trade. The second determinant factor is the trader’s 30-day trade volume for the entire pairs plus the trade of the present day. It is recomputed at midnight (GMT) on daily basis. CEX.IO takes: from the taker in a single trade a commission of 0.25% if to start trading with ≤5 BTC; from maker the percentage is 0.16. Margin trading is a way of trading in which a person trades with borrowed funds with their balance serving as the collateral for the loan. Margin traders do not need to complete any paperwork before trading fund can be made available to them as it occurs automatically at the same time with the position placement. They are also not required to create another account in order to margin trade. 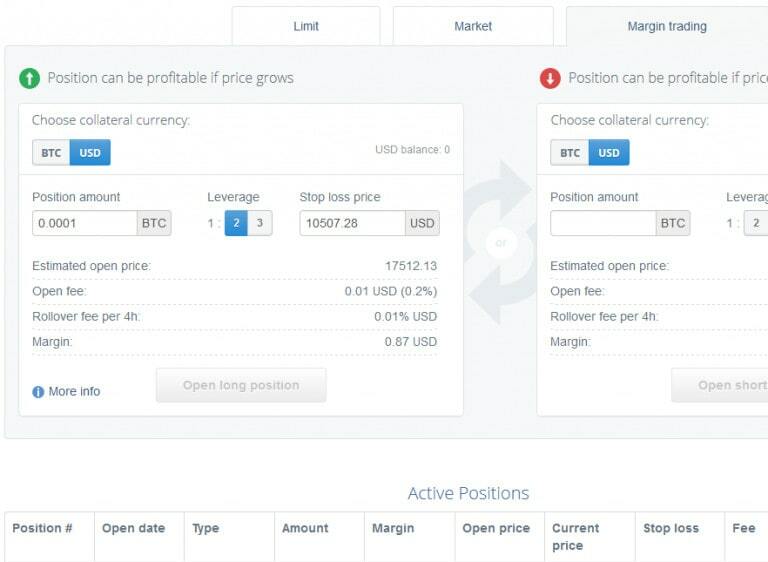 CEX.IO’s margin trading has a feature that makes it impossible for customers to run a negative balance. It attracts a rollover fee which begins counting after the first four hours. But it is not applied when the position is closed. Another impressive feature of this type of trading is the guaranteed stop loss. This implies that a portion of the order booked closes at a better rate than stop loss. However, margin trading can be very delicate and dicey given the volatile nature of digital currencies. Plus, the exchange doesn’t offer this service free of charge. The open fee is 0.2% while the basic account attracts a rollover charge of 0.01%. It is the same for all currencies. But the leverage differs from one to another. The closing fee remains 0% for all currencies in the basic account. Login into the site with your details. If you enable your account’s 2FA function, you will require your access code. Go to margin trading page. 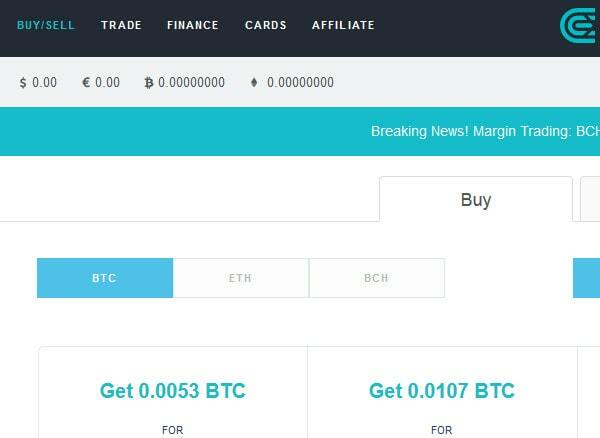 Look up at the top left-hand side of the website, you will find the button for trade, click on that and it will turn you to another page that contains the button for margin trading. A new page will turn up after you might have checked two boxes that warn you about the high risk of this method. Choose your preferred collateral currency. Note that margin trading does not work for all pairs. Type in your position amount, choose the leverage ratio. The ratio here means how many times the amount you have that you can borrow. CEX.IO offers 1:2 or 1:3 leverage which means that 2 or 3 times the amount you have in your balance can be lent to you. Place the order. You will need to wait for some time for the price to either go up or come down. Close the position. You will actually be able to do this when the price rises or when it falls down in order to make some gain. But what determines whether you will gain or lose is the position you open. Both long and short positions give profit if they are well utilised. For example, if one Bitcoin is presently sold for $600 with a prospect of an increase in the nearest future, and you have $300 left in your account, you can utilise it as collateral to borrow with 1:3 leverage at a long position. This means that with $300 in your account, you will get an additional $900. You may close the position if the price increases to $1,200. In this case, you will make a profit of $300 after your initial balance and the loan amount have been deducted. With your original balance of $300, it will not be possible for you to make such an amount of money under the same conditions and within the same timescale. Conversely, it is also possible to make some profit with a trading loan at short position. But this can only happen when there is a drop in price. For instance, if you are anticipating a drop in price at a period when a Bitcoin sells for $600, you can borrow bitcoin and sell them at the current price of $600. Then purchase them back when the price comes down. CEX.IO offers different kinds of accounts which include basic, verified, verified plus and corporate accounts. Each has its features and benefits. Basic account users can purchase and sell bitcoin only with Visa and MasterCard and they have the lowest limits. To get larger limits and more payment options, you have to upgrade to verified account or verified plus which in addition to having higher limits gives users priority support benefits. As the name suggests, the corporate account type makes it possible for users to trade with their corporate accounts. Beyond this, customers that sign up for this kind of membership enjoy certain benefits which others don’t get. There are limits for each account types regardless of the kind of transaction you are performing. For example, the daily bank card deposit limits for basic and verified accounts are $1,000 and $3,000 respectively while the verified plus and corporate accounts have no maximum. 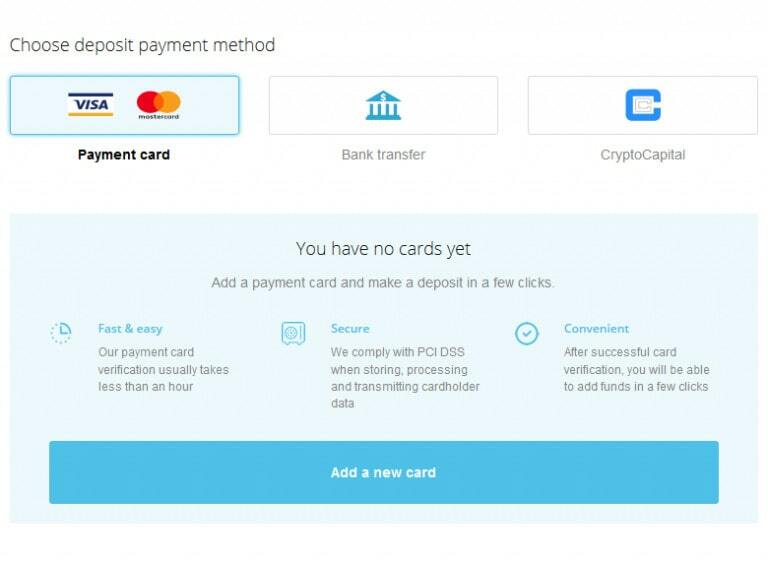 With basic and verified accounts, one can withdraw $1,000 and $10,000 on Mastercard on daily basis while there is no limit to the amount of USD you can take on from verified plus and corporate accounts if use Cryptocapital. CEX.IO accepts funds only in four currencies. But here, we will provide information on USD and EUR payment options. Note, the cumulative amount you will withdraw or deposit every day, week or month will not be more than your account limits. Check the table below. These payment options are not available in all countries. Traders from Zimbabwe, Yemen, Vietnam, Vanuatu, Uganda, Syria, Sudan, South Sudan, Libya, Somalia, Laos, Lebanon, North Korea, Congo, Cuba, Central African Republic, Iceland, Ethiopia, Iran, Iraq, Afghanistan, Burundi, Bosnia and Herzegovina, and Afghanistan cannot deposit money with MasterCards and Credit cards. Check the CEX.IO website for other payment options and countries restricted from using them. CEX.IO offers help with live chat support services. Their website also has a FAQ page where you are likely to find answers to your concern. You will also be able to reach the customer care representative of the company by filling out their inquiry form from the help centre page of the platform. CEX.IO also has a forum from where you can reach out to professionals in case you have any confusion. Trading services are web-based. But the exchange has a mobile version which unfortunately does not support margin trading or buying/selling option. Also, there’s API tool, that gives an opportunity to process 600 queries per each 10m. This platform divided on 3 solutions for different trading levels: Rest, WebSocket, Fix. 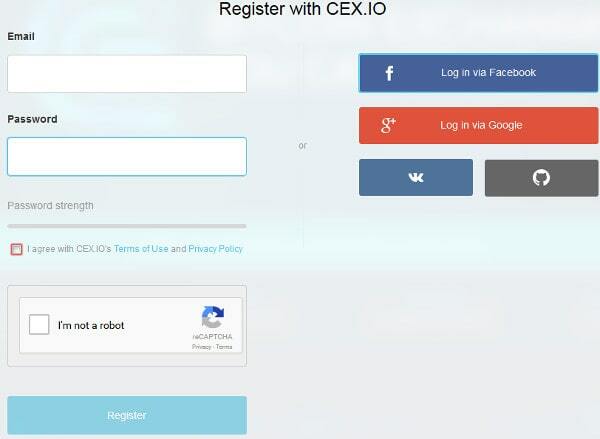 CEX.IO secures the account of users with 2FA code against unauthorized access. If you enable this feature, you will be able to receive your 2FA code via Smartphone app Google Authenticator which is compatible with Windows, Android and iOS phones. 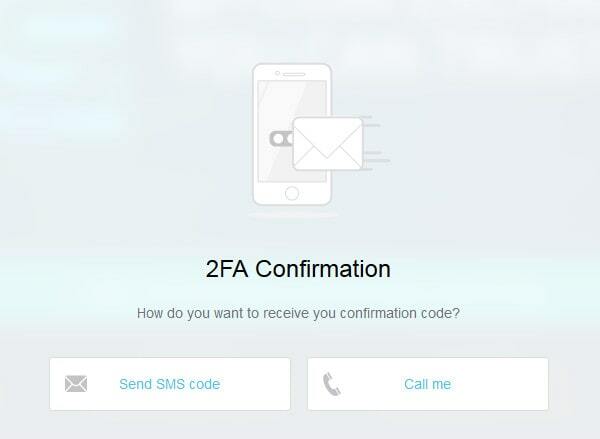 You can also choose to receive the code as an SMS or phone call. Disabling the 2FA feature of your account makes it vulnerable to hackers. The exchange is also licensed and operates with a number of certifications such as ICO certificate of Registration, Certificate of Incorporation, PCI DSS, security option (with fee 2 EUR/USD per day) for enhanced security and to give traders peace of mind that their investments are secured. Apart from this, it has privacy, refund, anti-fraud and AML/KYC Policies as well as other forms of legal documents such as risk warning and limits and commissions to ensure that their legal rights and those of their users are not violated by either of the parties.